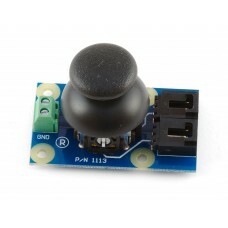 This miniature joystick has two axes and a pushbutton. 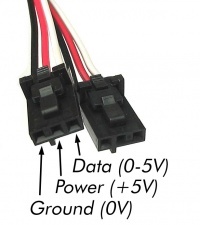 Each axis, up/down and left/right, has a potentiometer with a center value of approximately half the supply voltage. When you move the Joystick from its center position the value will increase or decrease depending on the direction. 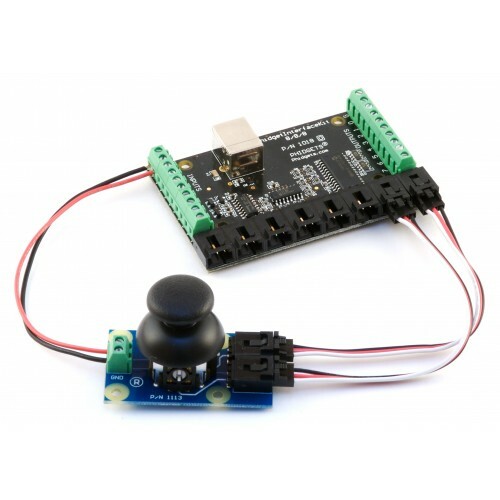 Pressing down on the Joystick pin will make a momentary contact that can be connected to a Digital Input through the terminal blocks. 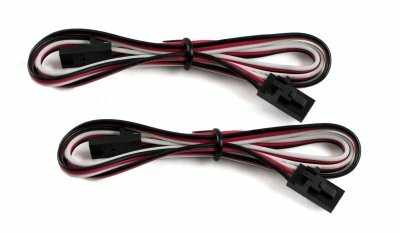 Any Phidget with a Voltage Ratio Input port and Digital Input port, here are some compatible products. We will be using the HUB0000 for this guide. 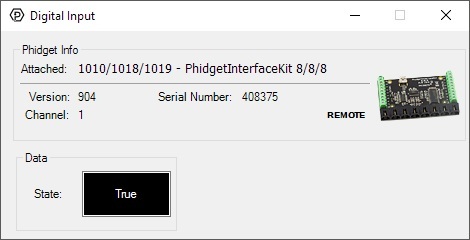 Connect the 1113 to the HUB0000 with the Phidget cables. 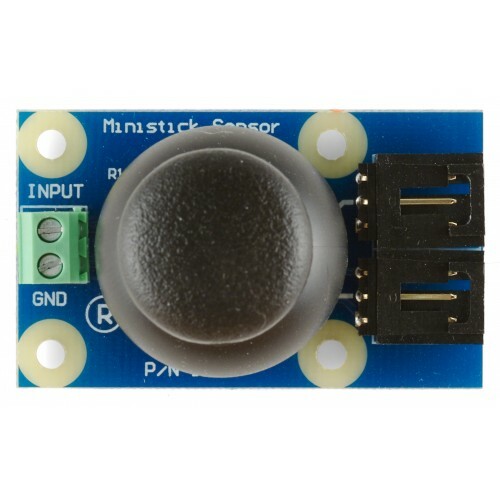 One port is needed for each axis of the stick. 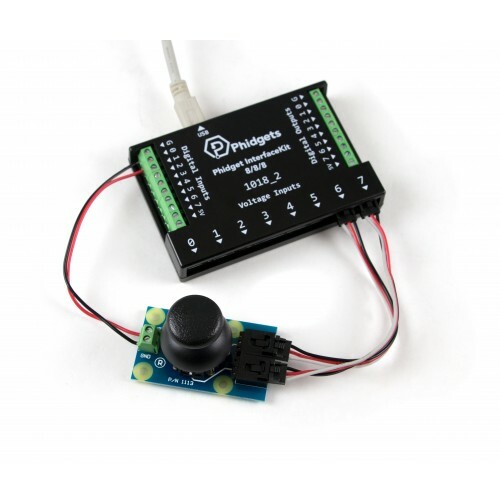 Connect the 1113 to the HUB0000 digital input. Now that you have everything together, let's start using the 1113! 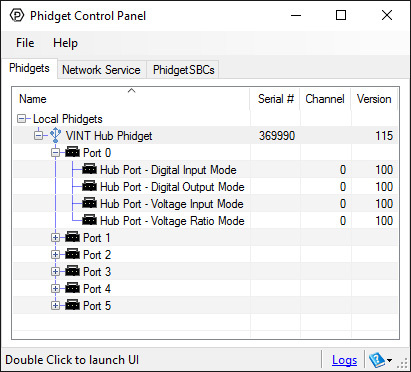 In order to demonstrate the functionality of the 1113, we will connect it to the HUB0000, and then run an example using the Phidget Control Panel on a Windows machine. 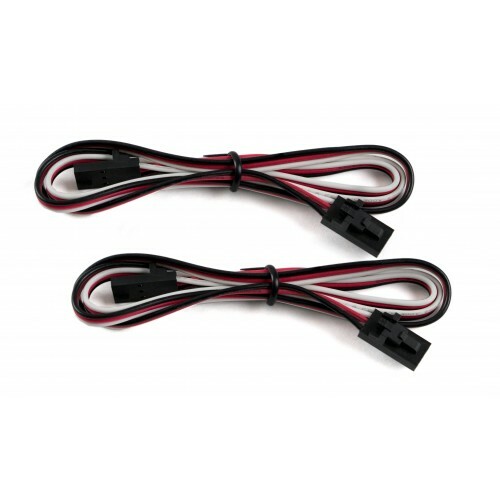 Linux users can follow the getting started with Linux guide and continue reading here for more information about the 1113. 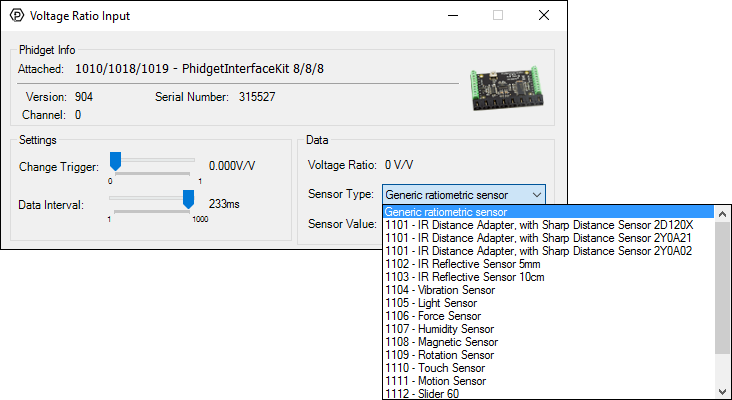 Select the 1113 from the Sensor Type drop-down menu. 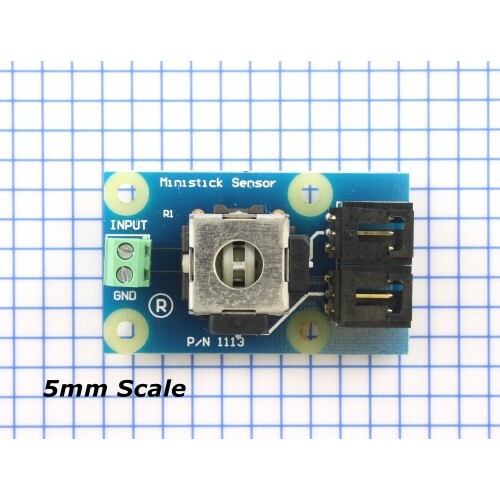 The Sensor Value will now return a value between -1 and 1. When you move the joystick from its center position, the value will increase or decrease depending on the direction. The 1113 has two axes and a push button. 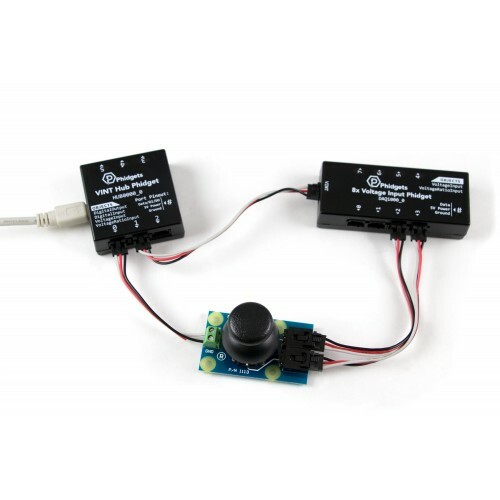 Each axis, up/down and left/right, has a potentiometer with a center value of approximately 0.5 V/V (or 0 when using the Sensor Value). 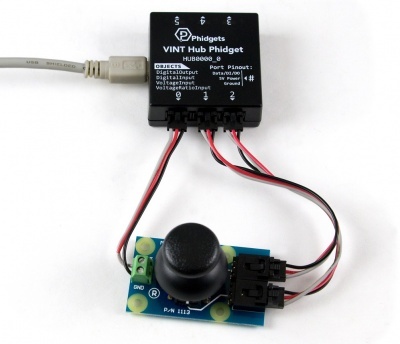 When you move the joystick from its center position the value will increase or decrease depending on the direction. 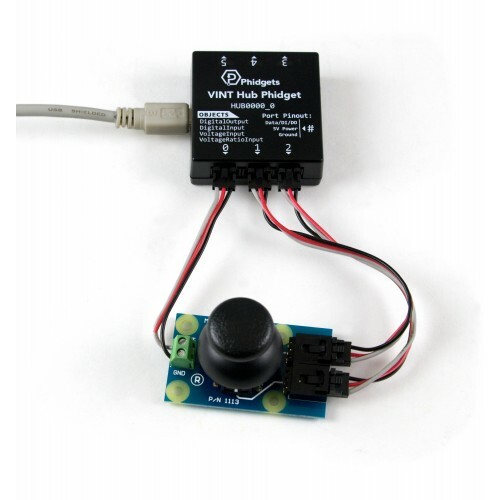 Pressing down on the joystick will make a momentary contact that can be connected to a digital input on any compatible product.